Hello and welcome back to the Downtown Fit Camp blog! In our last blog post, we began discussing some of the odd beliefs and practices of athletes in the ancient world. Some such practices include hot-cauldron lifting, oil applications, and washing babies — the warriors of the future — in wine. Read part one of our blog series and be sure to visit our website to learn more about our gym’s bootcamp classes, to see how we can help you reach your physique and fitness goals. Our fitness classes are offered throughout the day to accommodate your schedule. Visit our website to learn more. Though some fitness and health practices of the ancient world are inline with those that we have today, many seem absurd to us modern athletes. Thankfully, we have science to guide us and help us determine if the latest workout is indeed a means to get ripped or not. It is believed the yoga and related workouts may have been practiced by the ancient Egyptians. In paintings, people are seen doing modern day yoga poses. It is speculated that Roman gladiators carbed up on a diet of barley porridge mixed with beans. However, the practice was criticized by the Roman physician Claudius Galen who though this high-carb diet made the gladiators fat, slow, and unfit for combat. Ancient Spartans were anything but lax about their fitness and training for war. In all that they did, they devoted themselves to becoming the best warriors in the world. To prepare their warriors for the conditions of war, soldiers were underfed and the food they were given was bland. As a result, being overweight and out of shape in Sparta, could result in public ridicule and banishment. The idea of weight loss and weight gain being associated with the consumption of wine isn’t a new concept. Spartans often avoided wine and Pliny the Elder advised those wanting to gain weight to drink wine with their meals and those wanting to shed pounds to avoid it. It wasn’t just the yogis who proclaimed that breath control was a must to be healthy. Hua Tuo, in ancient China, believed that working out is a must for the body to be healthy. He also taught a stretch called Tiger Pawing that was for the purpose of improving one’s respiratory capacity. 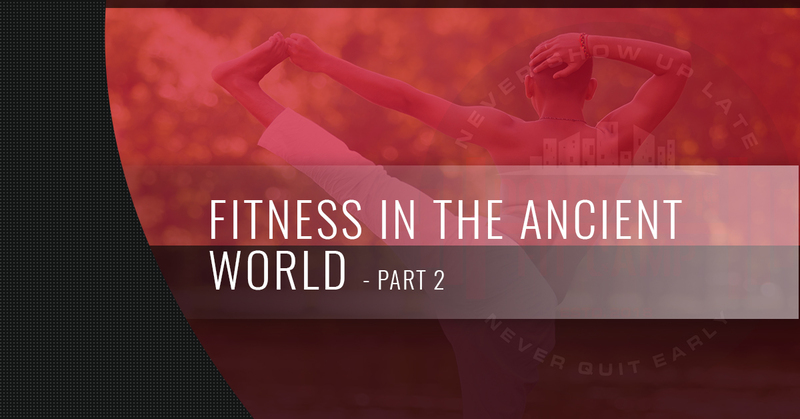 That wraps up part two of our ancient world fitness blog series. To learn more about how the Spartans became the famous warriors that they are remembered to be and other ancient world fitness practices, as well as practical tips for modern athletes, stay tuned for upcoming blog posts. If you are ready to take your fitness to the next level, visit our gym’s website to learn about the fitness and bootcamp classes we offer in San Bernardino.